The following is a Christmas-time spiritual reflection by World Relief Seattle’s Interim Director, Luke Williams. The words of the well-known carol point to one of the primary questions of Christmas: Is there room in my heart for Christ? Particularly in the midst of the busy-ness, anxiety and consumerism of our modern world, so much can crowd out and clutter up the soul space Christ longs to fill. When Jesus entered the temple and “drove out those who were buying and selling there, and overturned the tables of the money changers and the benches of those selling doves” (Mark 11:15-17), he quoted two Old Testament passages that have become important for us at World Relief Seattle. He contrasts the vision of “a house of prayer for all nations” found in Isaiah 56 with Jeremiah’s indictment of the “den of robbers” (chapter 7). Both passages speak strongly for inclusion of foreigners and against oppression of the most vulnerable. Luke greets a travel-weary refugee family at SeaTac Airport. Now, I realize that clearing the temple isn’t a typical “Christmas story”. I’m not suggesting that you replace the nativity scene on your mantle with a statuette of Jesus chasing merchants and livestock with whip in hand. Yet, surely this is one key dimension of the incarnation: Jesus came to clean house. Further, in this particular story, I would argue that one reason, among many, that the marketplace in the temple courts so angered Jesus was simply that it got in the way. The outer courts were meant to be the place where God-fearing men and women from all nations could gather to worship the Lord. A bustling market is hardly conducive to the nations gathering for prayer. Consistent with the special provisions and protections in the Old Testament around treatment of foreigners and other vulnerable people, Jesus consistently taught and acted in ways that challenge us to broaden our welcome. In fact, there are at least to ways in which Jesus personally identified with immigrants. First, before the age of two, he and his family fled to Egypt to escape political violence. Second, in the well-known parable recorded in Matthew 25, Jesus made the startling claim that whatever we do (or do not do) to the “stranger”, we do to him. This Christmas season, in the spirit of cleaning house, I’m wrestling with a slight variation on the above question: Is there room in my heart and life for Christ to come as a refugee, as a foreigner, as someone very different than myself? As with any question worth pondering, it is best acted upon as well as reflected upon. The spiritual lessons and blessings of cross-cultural friendship can only be known by actually becoming friends. Hospitality is learned by giving and receiving it. This Christmas, 5 local churches are serving as Good Neighbor Teams, a handful households have opened their doors to be hosts. 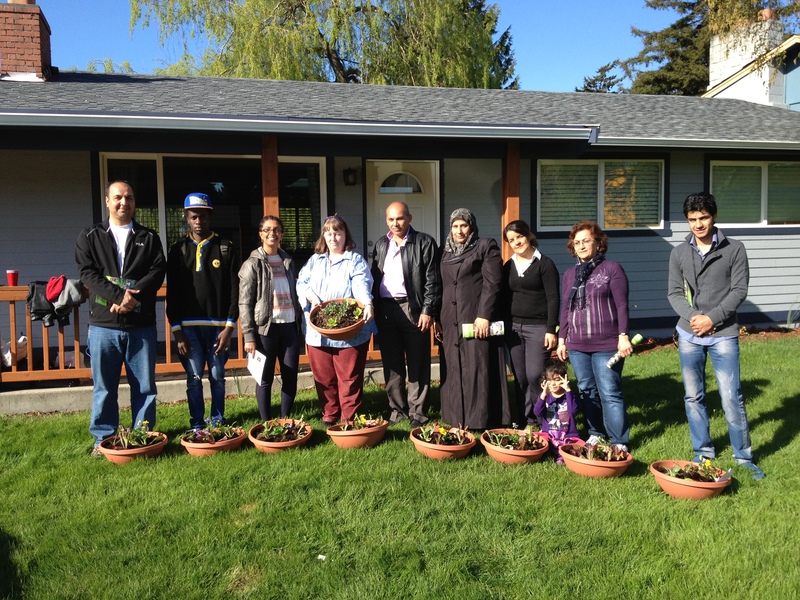 45 local volunteers are currently paired with newcomers as Cultural Companions. I trust they will find what my family has found to be true—making room is small sacrifice for the abundance we receive. From all of us at World Relief Seattle, we wish you a very merry and roomy Christmas! This entry was posted in Faith, Reflections, Staff Reflections on December 22, 2016 by World Relief Seattle. The following is a reflection by Calilee, a smart and spunky AmeriCorps member who teaches English to newcomers at World Relief and cares deeply for the success of her refugee students and friends. In honor of Martin Luther King Jr., the English classes had a writing activity in which they interpreted their own “I have a dream…” statements. I stood in front of my English students getting goosebumps up and down my arms as I read the speech that Martin Luther King Jr. gave on August 28, 1963. “I have a dream” I read aloud, “that one day on the red hills of Georgia, the sons of former slaves and the sons of former slave owners will be able to sit down together at the table of brotherhood.” I am from Georgia. I have read this speech and have learned about Martin Luther King Jr. many times over the years, but the story of who this man was and the message that he brought to our country had never impacted be like it did during this particular class. Our program participants have left their homes to find refuge for various reasons. One student explained that she came to America because her mother “has dark skin and curly hair, so people treated her badly.” I am sure there was more to the story than that, but truth was that this young, intelligent woman came to a new country so that her mother could live in a place were she wasn’t defined by her differences. We sat around a large plastic table, with our varying nationalities, speaking the only language we are all fluent in–broken English–and talked about how this was once a much larger issue that separated Americans from each other. My students were more engaged than I have ever seen them in any other writing activity. They have dreams that one day they will be able to find a stable country where they and their families will be safe. They dream that they will have a house of their own and find a job that can help sustain their families. They dream to return to school. They dream that one day they might contribute to our society and demonstrate their thankfulness for the assistance we have provided. Some even dream that one day it will be safe to return to where they fled from–they want to help the rest of the world fix what is broken. These are our friends and our neighbors. God has called us to love them, to welcome them, and to stand beside them. These are their words: some of the structure has been lost in translation, but their dreams and ideas are evident. I hope you will take a moment to read through what they have to say. This entry was posted in Culture, Current Events, ESL, Reflections, Staff Reflections on January 21, 2016 by World Relief Seattle. Lloyd Merry Evans, a dear friend of refugees and of the World Relief family, passed away on November 17, 2015. Lloyd’s service to refugees began in the late 1990’s when his church, Maple Valley Presbyterian, sponsored a Kurdish family of refugees. As Lloyd remembered it, “My church friends invited me to a picnic with the Kurdish family. I wasn’t really interested.” But he had no other plans so he went to the picnic and was moved by the family’s story of arrival to the U.S. Through this experience, he found out about refugees’ need for furniture and household goods for their first apartment in America. But Lloyd did more than deliver furniture. He opened up his life to refugees in so many ways. His World Relief coworker, Nataliya Semeshchuk, recalls once when a Ukrainian refugee family arrived and–with no prior notice–needed a place to stay for their first days in the country. Without hesitation, Lloyd offered his home. This sort of joyful generosity is something that Lloyd’s World Relief friends remember as typical. One thing that all of Lloyd’s World Relief colleagues remember about him was his sense of humor. One former colleague, Antonina Bozhko, remembers that whenever someone commented that Lloyd was doing the work of a much younger man in moving furniture, he’d smile and reply, “I’m busy. No time to get old!” It must have been this sense of humor, surmised another former colleague, which enabled Lloyd to do his work in the face of such incredible need. All of us at World Relief extend our deepest condolences to the Evans family and join them in mourning their loss, while also celebrating Lloyd–a joyful and tireless friend of refugees. We praise God for this good and faithful servant! This entry was posted in Reflections, Staff Reflections, Volunteer on December 11, 2015 by World Relief Seattle. Like a tsunami, waves of terror from the Paris attacks are crashing upon American shores. Valid questions pour in about the U.S. refugee resettlement screening process. Securing personal safety – in the face of sometimes overwhelming fear – drives these understandable questions. Screening out terrorists is imperative and is the responsibility of our country’s national security agencies. That said…as Christians, what is our unique responsibility as followers of Jesus in all of this? What should we be most concerned about – should it be our safety? Our biblical identity makes us Christians first and Americans second – not the other way around. Let’s take a step back. What if we moved from a security-centered refugee conversation to a Jesus-centered refugee conversation? It might look like exploring the Scriptures surfaced in Relevant Magazine’s article, “What the Bible Says about How to Treat Refugees.” It might also look like Christians in the West learning from Christians in the majority world who face terror and persecution daily as explained in the Christianity Today article, “Terrorists are Now the Persecuted Church’s Greatest Threat.” It might look like Christians asking the question, “What is God up to?” like the Desiring God blog that sees a sovereign God purposefully bringing the nations (rather than fear) to our shores. A Jesus-centered refugee conversation might cause us to remember that we are in fact following a Middle Eastern Refugee Savior whose family fled a genocide to Egypt. We might remember that our biblical identity as “strangers and aliens” here on earth makes us Christians first and Americans second – not the other way around. A Jesus-centered refugee conversation might look like learning how to follow a God who “did not spare his own Son, but gave him up for us all” (Romans 8:32). This same sacrificial God commands us to “welcome the stranger” and “love him [the immigrant] as yourself” (Leviticus 19:34). As the tides of terror wash up on your emotional shores, make sure your fears are not being whipped up by rumors or by a loss of focus on Jesus the Refugee. Following Him as we welcome Muslim Syrian refugees into our homes and hearts might be the courageous mission He is inviting us to join. Call or email your Senator and Congressional representatives to let them know that you support refugee resettlement in Washington and want to continue to see our State as a safe refuge for people fleeing terrorism and persecution. This entry was posted in Advocacy, Current Events, Faith, Reflections, Staff Reflections on November 25, 2015 by World Relief Seattle. Nine months ago, my partner and I moved into what has become known as the Refugee Welcome House (RWH). The RWH is a residential space on the Kent East Hill designated for the purposes of community building and refugee integration with the local community. The house is currently a partnership between Kent Covenant Church (KCC) and World Relief Seattle. One of the primary goals has been to create a safe space for people from different backgrounds to interact and build mutually-transformative relationships. Over the past several months, we have hosted movie and game nights, container gardening classes, fellowship group meetings, volunteer and intern trainings, job club meetings, family-style dinners, and even a baby shower for an Eritrean woman thrown by her American-born friend. Over 500 refugees, volunteers and community members have connected with one another in this humble, 1000 sq ft house. We have temporarily hosted 22 refugees for various reasons – mostly because they needed a place to stay for a couple of nights. Just last week, we hosted a family of seven from Colombia. 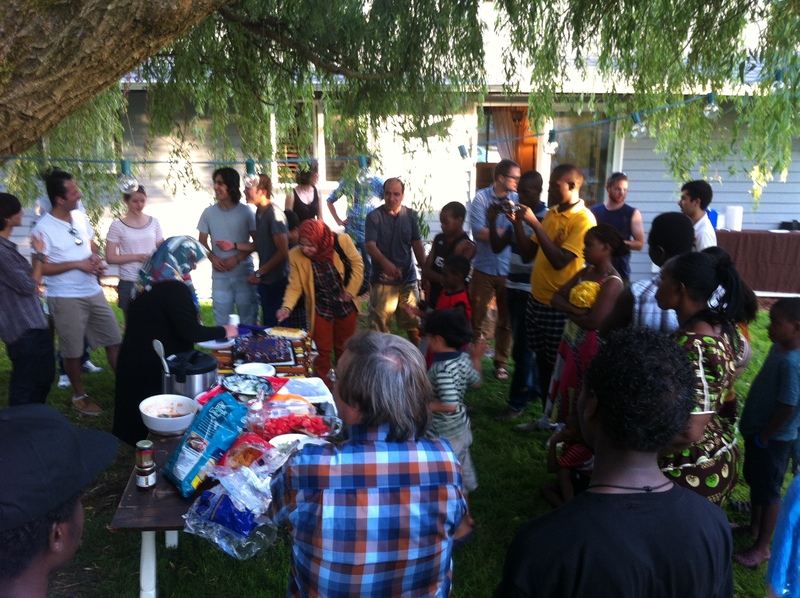 Last month, we had a BBQ with almost 100 people in attendance from what felt like just as many countries. Living here has been quite an adventure, to say the least. And yet, we are convinced that it is a great privilege to be in this place. We can tell you compelling stories of families who have defied the odds and escaped repressive regimes, only to find themselves sipping tea in our living room. We’ve shared in the joy of first jobs, new-born babies, and families reunified after many years apart. Unfortunately, we can also tell you sad, difficult stories of individuals who have struggled to find community in a nation who often fails to welcome their neighbors. The RWH has funding for the remainder of the year, and we are currently looking for more partners to continue the project. If you or your faith or civic community is interested in partnering with World Relief Seattle, please contact Luke Williams at (253) 277-1121. Like most of the grand initiatives to be birthed from our office in the last 30 years, this project was originally the idea of Cal Uomoto. His photo hangs in the house as a tribute to work he started and that continues to multiply each day. We miss you, Cal. This post was written by Stephen Johnson, Employment Specialist at World Relief Seattle. Stephen, and his wife Whitney, currently live in the RWH as live-in hosts and facilitators. This entry was posted in Staff Reflections on October 11, 2013 by sjohnson. Bal: Are you my Brother? I vividly remember the night, in November 2011, that I met Bal—I helped his caseworker pick his family up at the airport. One of the first things he asked me about in excited, thick-accented English was my faith. He wanted to know if I was a brother in Christ. As someone who had endured significant persecution and isolation as a follower of Christ, he was eager to meet other believers and to find out if what he had heard was really true: could his family finally enjoy religious freedom here in the States? As we walked back and forth from the World Relief truck to their apartment, bringing in the last few household items, Bal was already encouraging me in my faith, telling me how God was using me for his purposes by welcoming families like his who needed a safe place to live in freedom. That was the first of many times that Bal has spoken encouraging and challenging words to me. Our families have become friends, sharing meals together, going to the zoo, deciphering our different accents and phrases, and of course praying together. Today, Bal is working hard in a housekeeping job. He recently changed his work schedule to allow him to continue his studies in the afternoons. His wife, Uma, has learned a lot more English and their little boy is growing up strong and healthy. Perhaps the thing that Bal is most excited about these days is that he is now leading the youth group of the Bhutanese Christian Fellowship at Kent Covenant Church. Each Saturday morning, Bal gathers a group of young men and women to grow in their faith and develop their God-given talents. I doubt there is a youth leader in the American Church who is more thrilled simply to have the chance to teach a Bible study in freedom. This entry was posted in Client Spotlight, Staff Reflections, Uncategorized on June 27, 2013 by Scott Ellis. “What is today?” Ashmi asked. She had a certain smile on her face that, even after 6 months of knowing her, I had not seen before. “Today is March 14th,” I replied. “I will always remember this day,” she assured me. As an Employment Specialist for World Relief, one of the highlights of my job is the day when refugees become employees. Less than one percent of refugees worldwide make it to a third country. Most end up staying in the country to which they initially flee, which is usually not much better than what they left behind. For individuals and families who have survived systems of oppression and confronted tremendous barriers, getting your first job in a relatively safe place can seem like winning the lottery. I like to think that I play a part in the puzzle, but I am also certain that in this economic environment, employment is truly an act of God. Alhamdulillah, praise be to God, as our Arabic-speaking friends often remind us. Only two hours earlier, we were preparing at the office before we left, going over a list of practice interview questions that this particular employer has asked in the past. “What does task mean?” “What is attention to detail?” “Should I sit or should I stand during the interview?” I did my best to answer as many questions as possible. If this manager likes these two, maybe she will want to hire more refugees in the future. As we walked to the car, Ashmi could not hide her ample apprehension. “My heart is beating so quickly—ninety beats per minute,” she laughed. Today, I would take Ashmi and Ayan, a Somali woman who recently arrived from Ethiopia, to interviews for housekeeping positions. Two stoic women of the same age and demeanor, yet their stories remained worlds apart. Despite the disparities, they seemed to genuinely enjoy each other’s company. “Do not worry, we can help each other,” Ayan assured Ashmi. There were two interviews. The first was a pre-screen with someone from Human Resources, at which they both did very well. Just smile and nod, I’d joked with them both before. The second interview was slightly more difficult. The manager spoke quickly, with a sense of urgency that every housekeeping supervisor seems to develop over time. I did my best to “translate” complex questions into simple sentences that they could understand. Alhamdulillah. They were both hired on the spot. From my rearview mirror, I could see both of them surreptitiously wiping small tears from their eyes on our short drive home. Today, I was a reminded that I will never fully know where my client’s have been or what they have gone through to get here. I will also never fully know the impact of our work – the privilege of being a part of God’s Kingdom here on earth. Today was truly a significant day for me as well. “Thank you to God also,” Ashmi added. This entry was posted in Client Spotlight, Refugee Employment, Staff Reflections on June 20, 2013 by Scott Ellis. I sat down to eat my lunch of hastily-thrown together stir-fried vegetables when my coworker, Santa, entered the lunch room. “Taghreed!” She exclaimed and ran out of the room. My mind raced to decipher what had happened. I looked at the clock – it was 12:30pm, an hour after a client, Taghreed, was scheduled to start her first day of work as a packager at a bakery in Kent. Thinking that Taghreed hadn’t shown up for Santa to drive her to work, my heart skipped a beat and I quickly ran to Santa’s office. Santa was holding out a heavy plastic bag to me. “Taghreed made you dolma as a thank you gift for finding her a job,” Santa told me. She had forgotten to give it to me and remembered when she saw me eating my lunch. On more than one occasion during the job search process I had told Taghreed that I loved dolma, a Middle Eastern stuffed vegetable dish. She had remembered and, quite thoughtfully, made some dolma for me – on her first day of work no less! 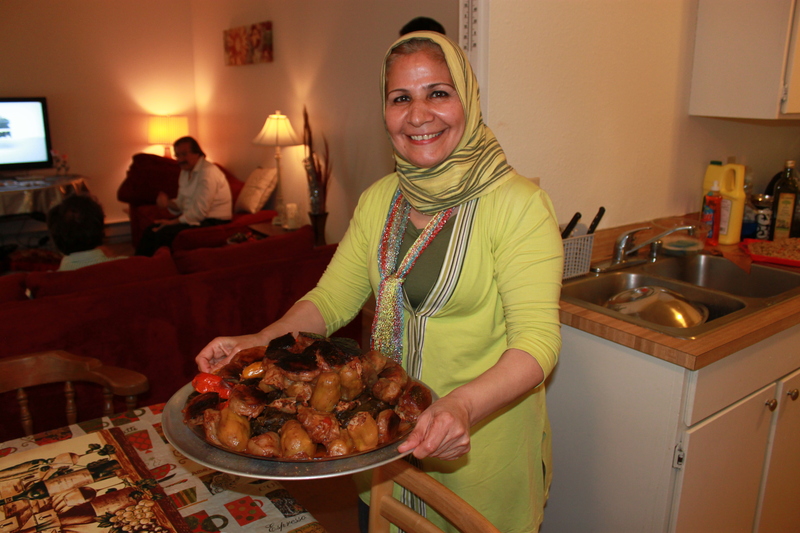 Taghreed’s dolma is just one example of the generosity and thoughtfulness (not to mention delicious cooking skills!) of the people I work with at World Relief. It is truly a blessing it is to work with such amazing people! This entry was posted in Client Spotlight, Refugee Employment, Staff Reflections on June 10, 2013 by Scott Ellis.